I am delighted to announce I have been invited to be a tutor at this prestigious event in Auckland in October. 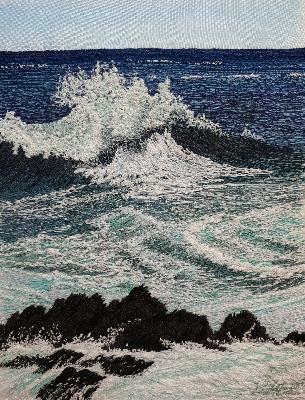 The Embroiderers Guild Headquarters NSW have purchased this piece of my work for their Collection. 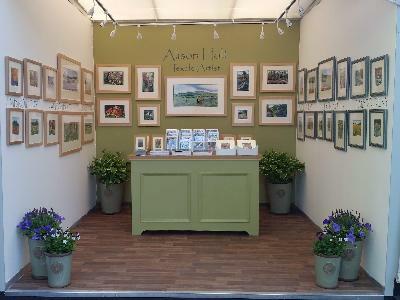 Good news, the RHS confirmed today that I will be exhibiting again at the Chelsea Flower Show 2019! Come and see me Stand 415 on Eastern Avenue! 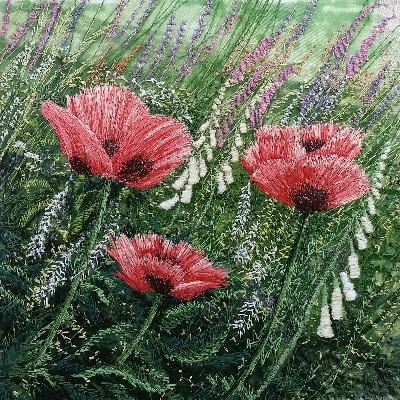 I have been invited to be part of the Festival of Contemporary Machine Stitch that the Embroiderers Guild of NSW is planning for 21 September to 6 November 2018. Inspired by Berninas 125th anniversary, this Festival is a mechanism for the promotion of machine stitch, past, present and future. 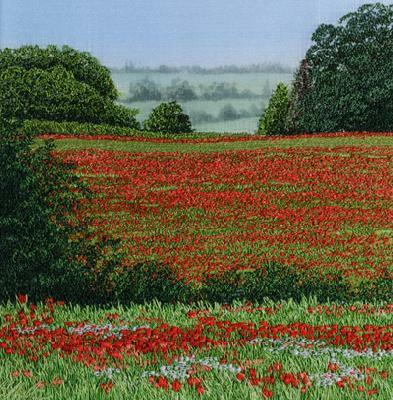 There will be machine embroidery workshops, artist talks and an exhibition of works from the Embroiderers' Guild Collection and a juried exhibition in the new Galleries at Concord West, entitled THREAD STITCH CLOTH. 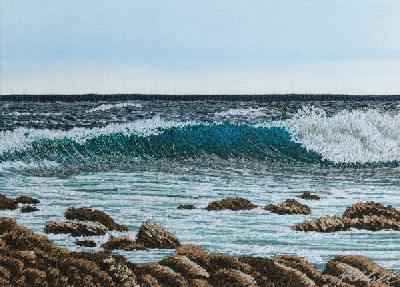 My workshop “Crashing Waves and Sea Spray” will be the final workshop and my Artist’s talk on the 6th November will be the closing event. 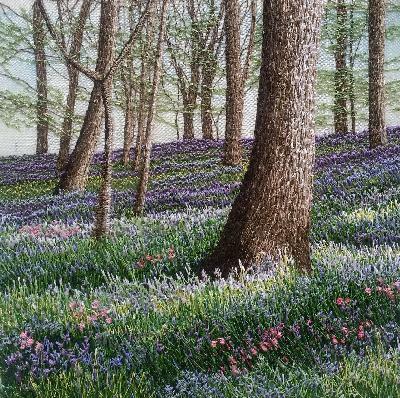 I will also have an embroidery of mine in the display, Up to the Highest Heights. 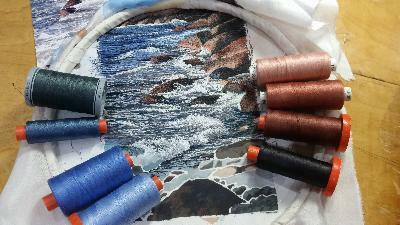 This will be pieces from the Guilds Collection and invited works from Guild members and well known textile artists. 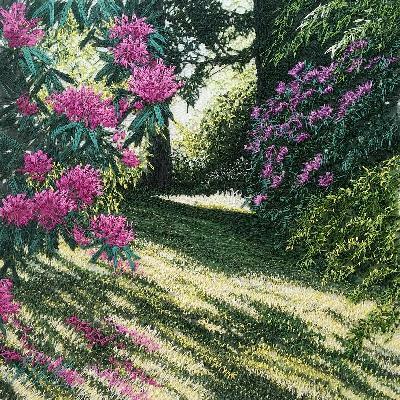 I am very happy to announce I have had my embroidery Sunlight and Shadows accepted for the 250th RA Summer Exhibition! After 2 days in London preparing my display it's all ready for the judges on Monday and the public on Tuesday. I have some beautiful flowers and plants decorating my space and a wide range of new embroideries, I am ready for the week ahead! 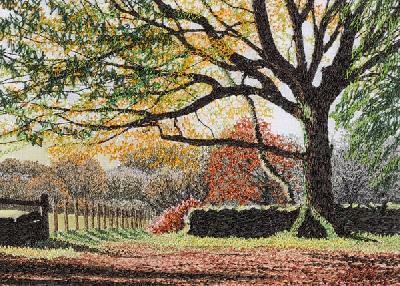 I submitted this piece to the RA Summer Exhibition and heard today it is through to the next stage. I have to deliver the artwork for the judges to view. Not there yet but very happy to be through to this stage in the process! A well attended PV at the Daniel Raphael Gallery in Marlebone tonight. Lots of visitors, enthusiasm for my work and a red dot! 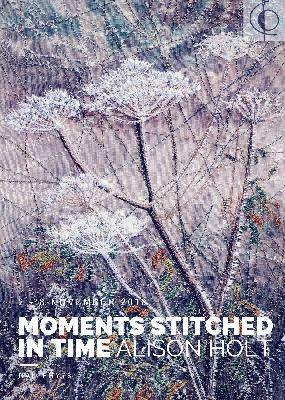 Delighted to report there is an article about me in Stitch magazine this month. 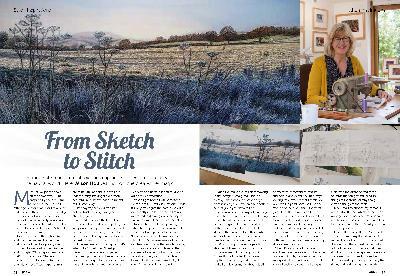 I was interviewed about my process, from sketch to stitch! 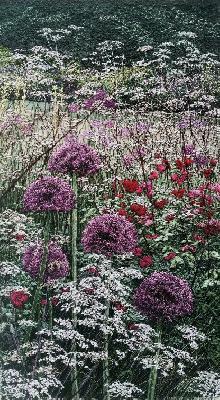 I am very happy to report my course in September at the Chelsea Physic Garden is full. I am looking forward to exploring the garden with my students for inspiration and spending 2 days painting and stitching in response to what we find! I am very excited to announce I will be teaching in Hastings, New Zealand in December 2017. The full details of venue, dates etc. are on my courses page. 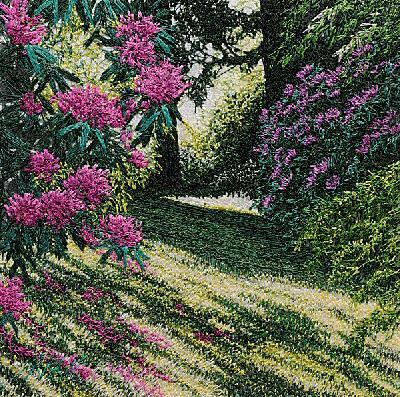 I have received my email from the RA about my entry to the Summer Exhibition. 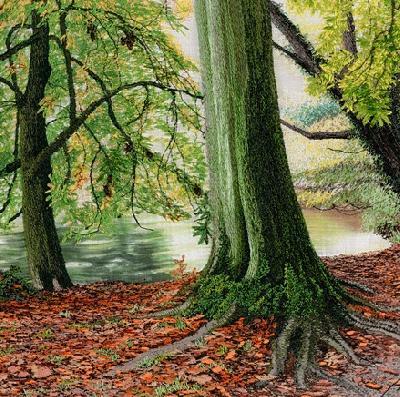 Thank you for submitting digital images of your work: WITH MOSS BENEATH MY FEET. 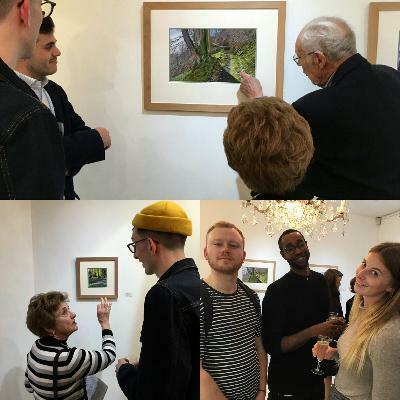 The Members of the Summer Exhibition Committee have given careful consideration to the images and regret that they will not be able to include your artwork in this year's exhibition. So there it is! Happy to say I am busy with so many other projects that I dont have time to dwell on the news. I am very happy to report students are rapidly booking their places for my course at the Chelsea Physic Garden in September. I am looking forward to this wonderful new venue and my students being inspired by the garden. Here is the booking page, only 7 places left! 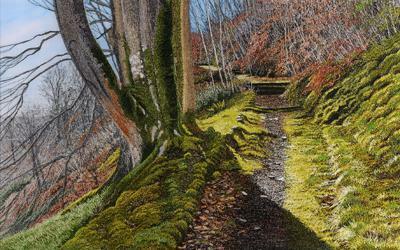 I have entered this embroidery The Moss Beneath My Feet into the RA Summer Exhibition! This is on the basis nothing ventured ...etc..I will keep you informed of my success or rejection! 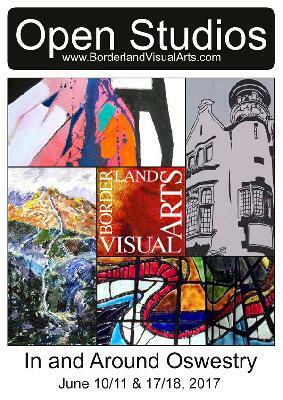 Its an opportunity to meet all the artists, see them working and chat about art, inspiration and creativity! My studio overlooks my garden and it will be a pleasure to see new and familiar faces visit me there. 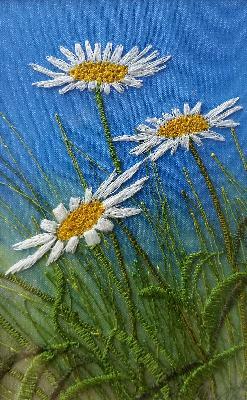 Announcing my course The Garden in Paint and Stitch at the Chelsea Physic Garden in London on Sept 14th 15th 2017. I am very happy to be teaching at such a beautiful venue. Inspired by the flowers and foliage of the Chelsea Physic Garden students will create a thread painted flower study on hand painted silk. Students will start this course exploring the garden for inspiration, taking photographs of flowers, observing shapes and form, gathering ideas for colour combinations and designs. Starting 2017 with an exciting flourish of creativity. 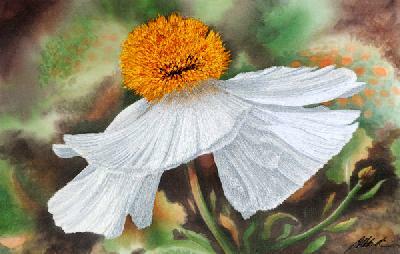 With The Chelsea Flower Show in mind here is a taste of the work I will be exhibiting there. 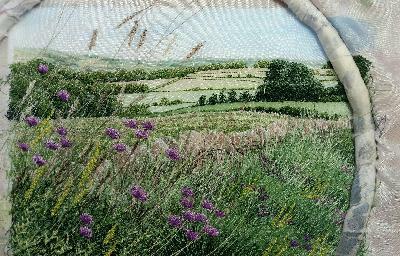 This is work in progress, it's still in the embroidery hoop and I have the roadside flowers and grasses to complete. My 2017 trip to Australia is ON! Margaret River, Perth and Port Macquarie are confirmed venues for November. The coastline of Australia is really spectacular and varied and I will be there with my camera looking for inspiration. It has its own scale, drama and colour palette that is very different from the UK. 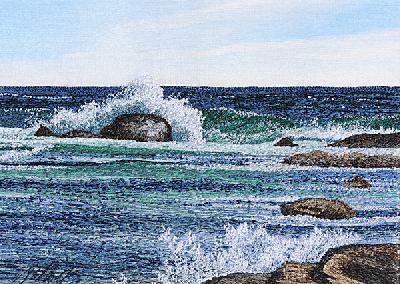 The rocky shoreline in this image was creating some great breaking waves. Beautiful!